Pair of Collared Sparrowhawks-- a wildlife carer lost a fully recovered Ground Parrot from a cage to one of these 6 weeks ago. But evokes, rather, thoughts pathological! Accompanying pix show some of the damage and one of the scruffy culprits. I noticed recently a number of birds taking dust baths. The reason birds indulge in this practice appears, at least in the literature, to be potentially diverse. On the day I photographed this Little Wattlebird (in my garden) the temperature was over 30C and the bird looked, as you can see, somewhat stressed, suggesting that it enables them to cool down, although it's not clear how this works. Has anyone a pet theory what the true purpose of this practice might be? Who the Hell was Horsfield anyway...? I expect you're wondering who Horsfield was? Well, I'm going to tell you anyway! You'll be pleased to know this is the 'potted' version. Thomas Horsfield (1773-1859) was an American hailing from Philadelphia. He trained as a medical doctor and visited Java while in the American Navy working as a ship's surgeon. He was very taken with Java and returned there to work and pursue his interest in Natural History. He collected insects and flowers and wrote several scientific papers on the subject. Later, when Java came under the control of the British, he collected for Thomas Raffles of East India Company fame. (I was surprised to come across a statue of Raffles in the Bogor Botanical Gardens--just South of Jakarta--by the way a great place to birdwatch). I digress. In 1819, ill health caused him to travel to London, where he became keeper and curator of the East India Co.'s museum. He was a founder member and Assistant Secretary of the Zoological Society of London. 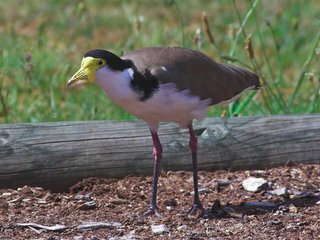 There he, together with Nicholas Vigor's, classified a number of birds, including many Australian species in the Linnaean Society's collection and together wrote a paper on the subject. I'd like to think that he noticed a difference in the plumages of the bronze cuckoos and for his efforts the species was named after him, but that's conjecture. He also had a tortoise and a hawk named after him. The wonders of the internet! Aren't you glad that's the potted version! 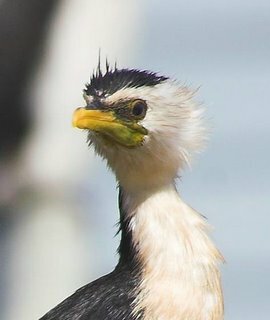 Couldn't resist posting this shot of a Little Pied Cormorant drying out, as cormorants do, after a fishing trip. Obviously used to the presence of humans, it allowed a close approach for this picture. Photographed on a local pier near Bellerive village. It's that time of year when 2 species put on a show that's worth looking out for. 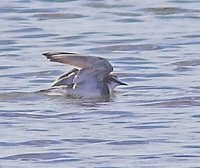 The most obvious are the muttonbirds--Short-tailed Shearwater--often now to be seen close inshore in great wheeling flocks. The Derwent River is one of the best vantage points, and the flocks regularly reach the Tasman Bridge and beyond. The second, is the White-throated Needletail, known to most of us as plain 'swifts'--they appear to have had several name changes. 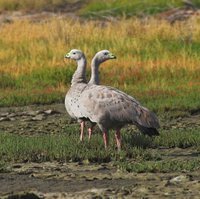 Although in some parts of the state they are regularly seen--notably the West Coast, in the South East they generally appear from about now and on into Autumn. They often need some finding, flying high and barely noticeable to the naked eye. A good time to look is before a thunderstorm front, I think they are attracted by the insects borne up by the fast rising air mass. It's often worth scanning the clouds with binoculars. They are also attracted to the thermals rising from the tops of hills on warm days. Normally they're seen dashing hither and thither across the sky chasing insects, but last Summer, I saw a flock of 60 odd over Bellerive, in a loose flock and flying in a straight line. 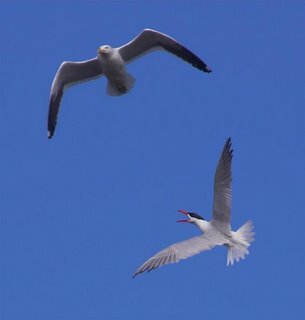 By coincidence, in flight, both species are surprisingly similar, although they rarely occupy the same habitat. 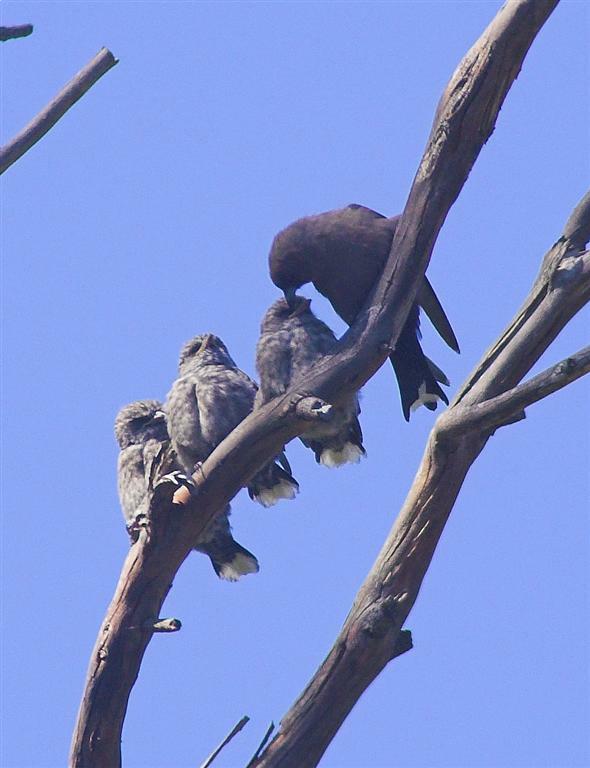 It's worth looking too amongst the Needletails for the rarely seen (in Tasmania) Fork-tailed Swift. I have yet to see one here, but I keep looking! 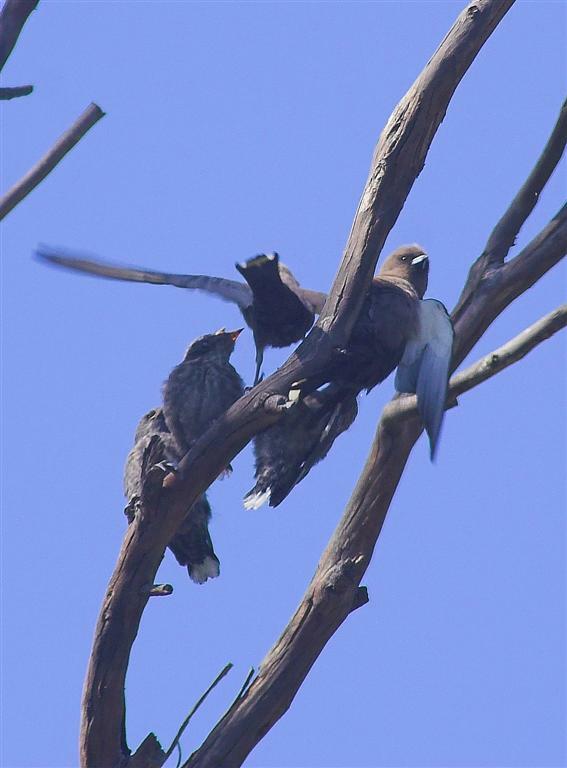 I spent sometime this morning watching a group of Dusky Woodswallows in the Peter Murell Reserve at Kingston. An obvious and common bird at the moment, these just fledged young are most probably a second clutch as I recall seeing similar sized youngsters here a couple of months ago. The fledglings spent much of there time on this dead branch about 8 metres up, preening, while keeping an eye out for their parents. 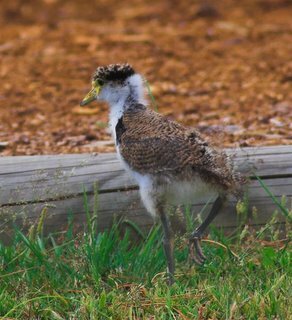 The pictures show preening of young by an adult--seemed to be preening those "bits" around the head that they were unable to reach themselves. Feeding, and an adult arriving with food and dislodging both the other parent and a youngster. 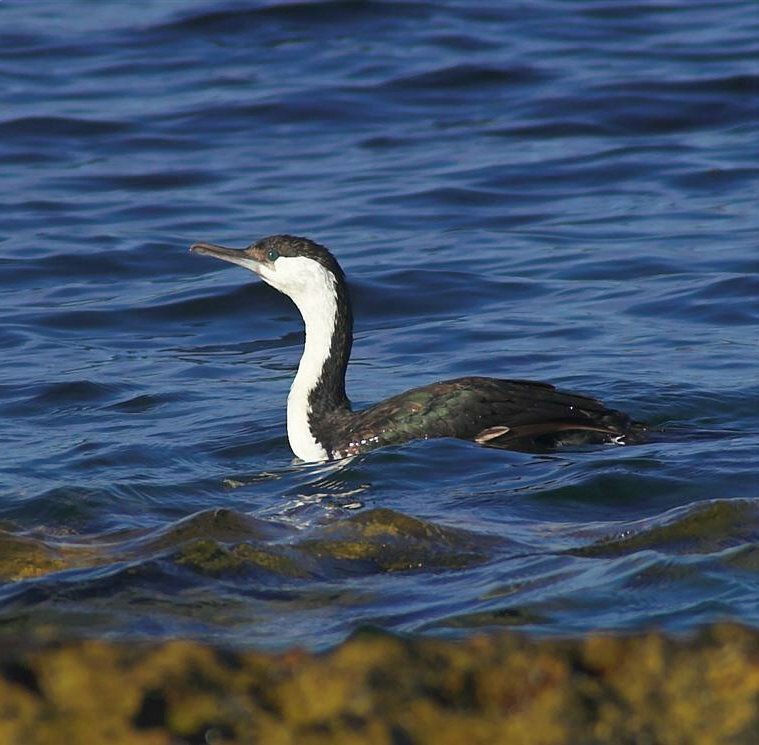 More Shags on the Rocks? My impression in recent years is that there is an increase in the number of Black-faced Shags in the Derwent Estuary. Bill & Els ,mentioned the numbers breeding on Betsey Island (see their earlier blog:"Iron Pot & Betsey Island 2/12/05"). Certainly around the Bellerive area, the numbers roosting on rocks and piers has increased. No doubt that could be explained in part, to the recent breeding season. I feel that it may have more to do with the banning of net fishing in the upper parts of the estuary, enabled in recent years. 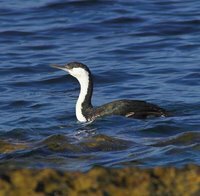 I have witnessed amateur fishermen pulling drowned cormorants from their nets and heard tales that are nothing short of horrific if true--(well you know what fishing stories are). I understand that Little Penguins suffer a similar fate. 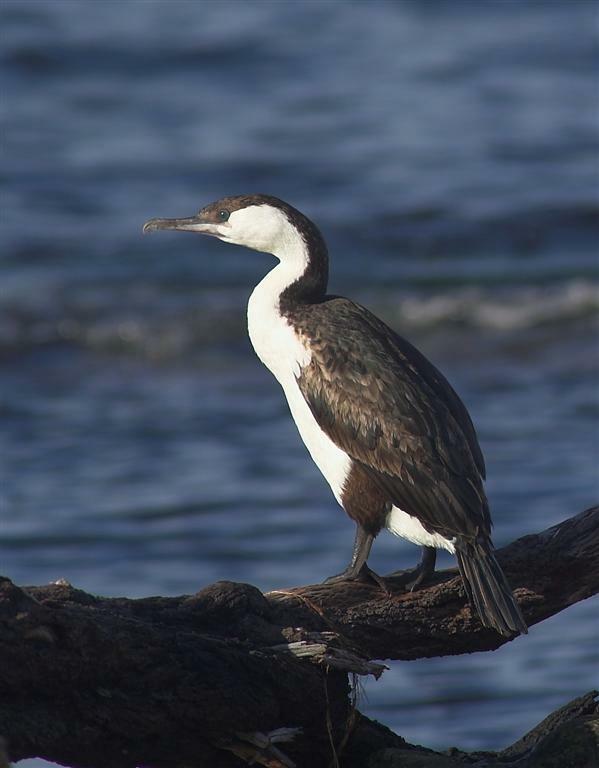 Tasmania, Bass Strait in particular, is arguably the stronghold of this Southern Australian endemic species, but the Derwent is one of the easiest places to see them. The accompanying images were taken on the Bellerive 2nd Bluff in the last few days. 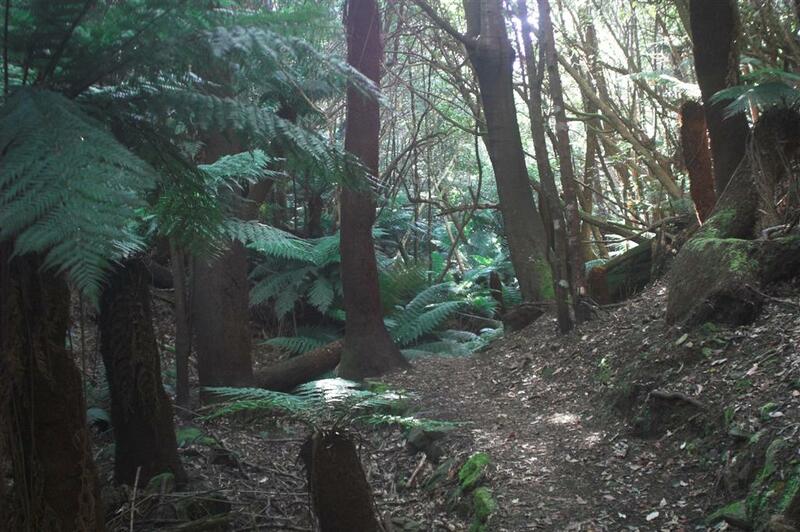 A few days ago I made one of my fairly rare visits to the Fern Tree Glade in the foothills of Mount Wellington. In recent years I've mainly gone there for the benefit of visiting birders, who have requested to see Scubtits, Pink Robins, Tasmanian Thornbills and Ground Thrush (I think properly called White's Thrush, although a field guide calls it Bassian Thrush). An early start on a very still day, I rated my chances of seeing all 4 fairly highly, and I was mindful of Murray Lord's comments (see "Questions Posed") about not reliably seeing Scrubtits there, a statement I agree with. I appeared to be the first arrival and climbed the steps and the first bird I saw and heard was a Scrubtit! To be honest I've never seen them that close to the entrance, but less welcome was the presence of a presumed family of Kookaburras. As you might expect at this time of year, it's pretty dry and will no doubt get drier. My impression over the years is that the general nature of the area is gradually changing. Many trees and other vegetation falls and is cleared, slowly opening up the gully and I'm not critical of this, it is primarily maintained as a walking track. As I walked deeper into the glade, I became aware of Pink Robins calling and shortly observed my first and then a second, both either females or juveniles. Several Grey Fantails and numerous Silvereyes briefly put in an appearance, and then I heard a Brown Scrubwren. This is a species that, in the past, I've always considered to be sure to see in some numbers, but this day they were either keeping quiet or the numbers have declined. In the canopy, and in the trees towering overhead, I heard Tasmanian Thornbills, several flocks I would guess. I must confess, I only had fleeting glimpses of these thornbills, but I have no doubt that they were Tasmanian. Only one species to go! Well to cut a long story short, I dipped out. Generally I've found them on the tracks away from the gully, and not among the Tree Ferns. It was cool enough in the reserve to create 'clouds' from expelled breath, and I started to wonder whether this was the reason for a general lack of activity--not much in the way of flying insects--apart from the mossies. Perhaps we've all relied on this venue to 'dish up' the required species too long. There must be many sites in this general area where these species can be reliably found--any suggestions? 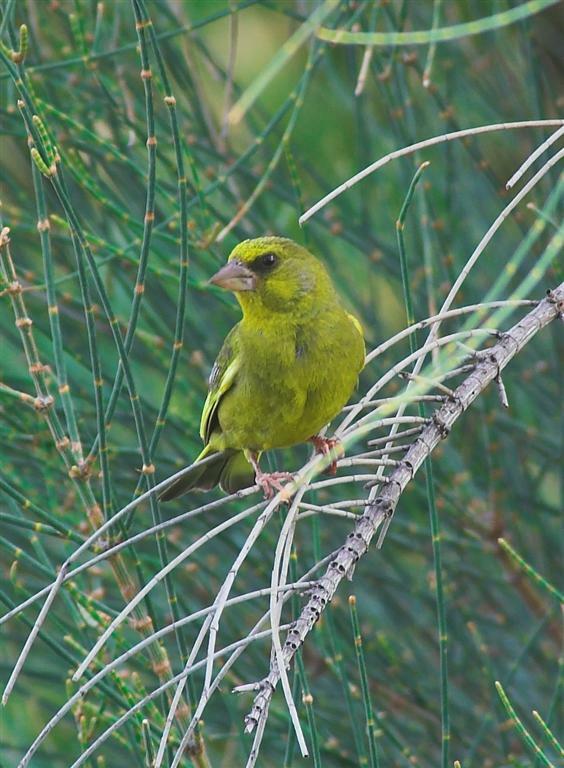 Two success stories in the bird world in this state, are the Goldfinch and Greenfinch. At the moment they are among the most obvious of species in and around suburbia. While the Goldfinch was probably introduced by well meaning 'acclimatisation societies', the Greenfinch is a much more recent immigrant. Probably originating in Victoria, the first records were in 1945 at Marrawah on the far NW coast. Since then it has spread far and wide. 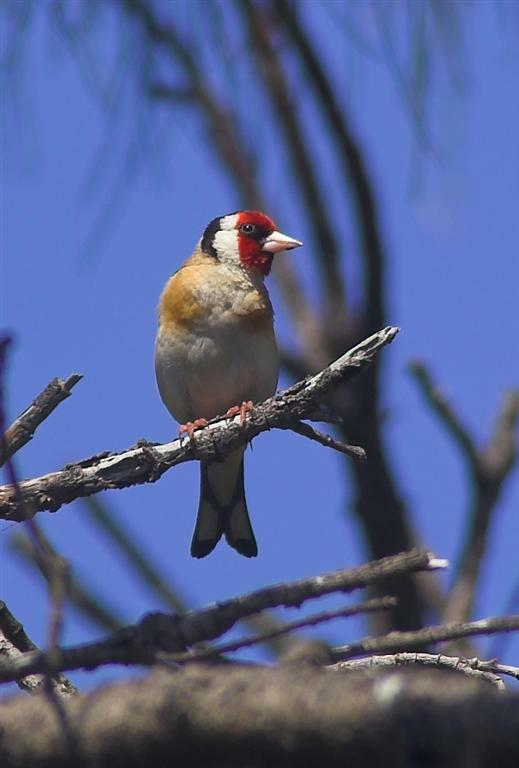 Flocks of 100 or so can be found during the Winter months, often in coastal areas and sometimes associating with Goldfinches. Probably neither species are high on your list of important species, but they seem to have occupied a niche not exploited by native species. It may be worth considering that in much of suburbia , especially during the Summer months,if it wasn't for our introduced species, our gardens might be somewhat lacking in birds, although some of us who grow soft fruit, might sometimes prefer it that way! 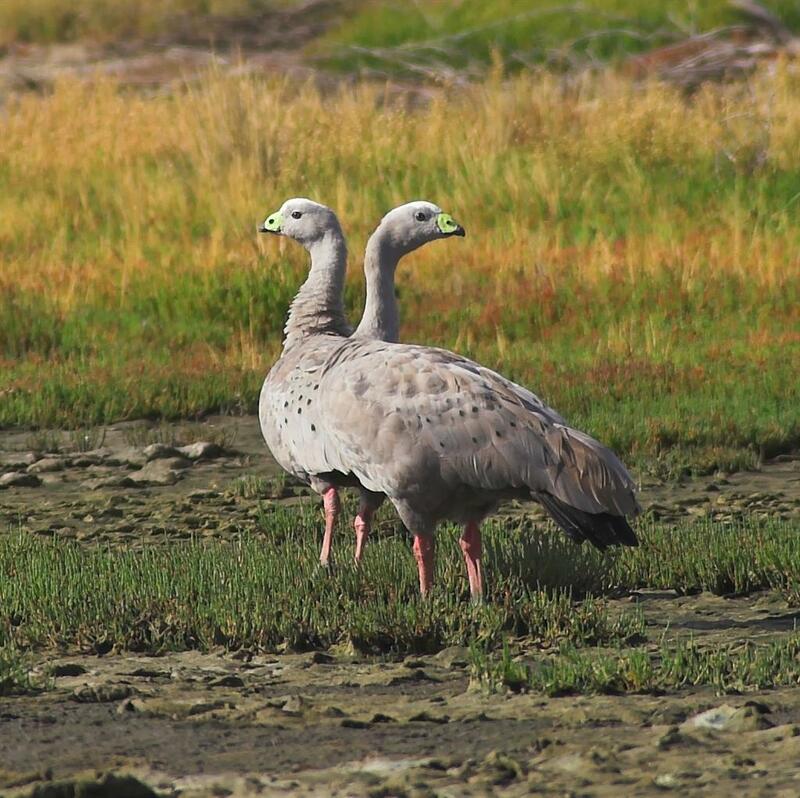 The 2 Cape Barren Geese hanging out at Orielton Lagoon for the last month or so. A somewhat amusing picture of what is essentially a Tasmanian species. I won't labour that point! They're actually quite hard to approach, but were caught between my advancing towards them and the golf course mower. One of the highlights for me at this time of year, is watching the abundant flocks of Musk Lorikeets. 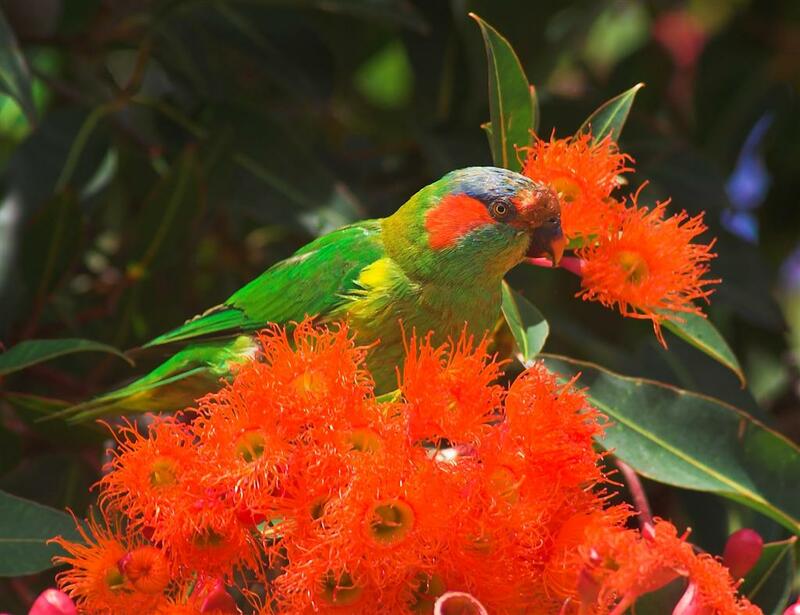 Most are feeding on eucalypt flowers, especially at the moment on the West Australian euc. ficifolia, a bright red flowering species, that unfortunately has a short flowering season. 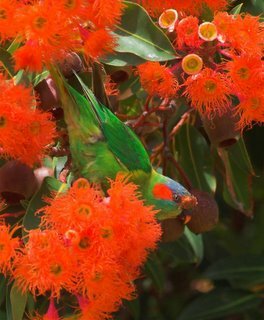 They are restless and noisy, and I noted that one eucalypt particularly favoured by them in the grounds of a nearby school was chopped down and I've often wondered whether the noise became too much. Perhaps I'm being uncharitable, but hearing the incessant calling, described in one field guide, as a 'metallic screech', for hour after hour, might try the patience of the most ardent birder. I've noted in my suburb (Bellerive), that a fly by from one of the local Hobbys, is one sure way of silencing them. Although abundant, photographing them is surprisingly difficult, mainly because they are so well camouflaged, which perhaps is surprising when you consider how gaudy the plumage is. Many shots were taken to get even these 2 shots. In suburbia at least, Musks are much more abundant than 20 years ago, possibly due to the popularity of planting native trees. Spent a quiet morning today in the Orielton area. All the usual inhabitants around the lagoon, plus a possible Grey Plover, seen from too far away to confirm ID. 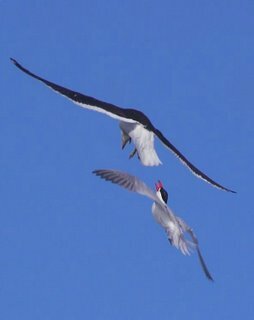 Perhaps the most interesting and exciting event was a confrontation between two relative heavyweights--a Caspian Tern and a Kelp Gull. Fairly evenly matched with the weight advantage to the Kelp Gull. But what the Caspian lacks in weight, it more than makes up for in its' pugnacious attitude to others, including humans who might unwittingly entire it's perceived territory. 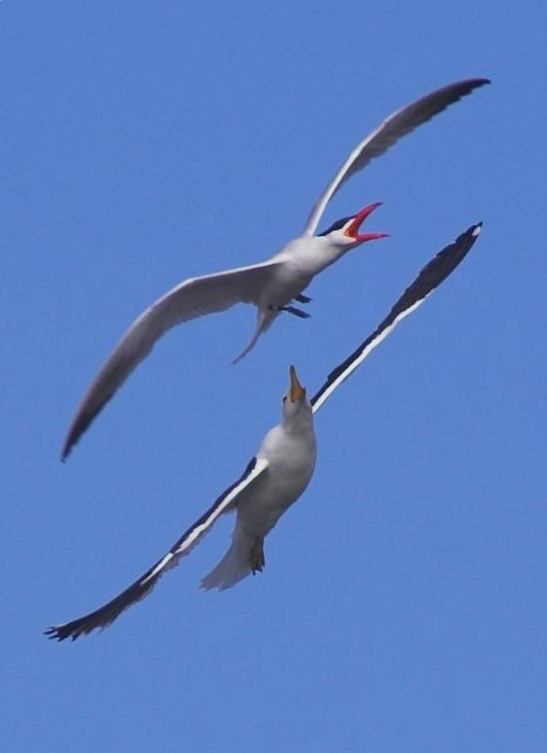 For those unused to the antics of Caspian Terns, it might be quite frightening. 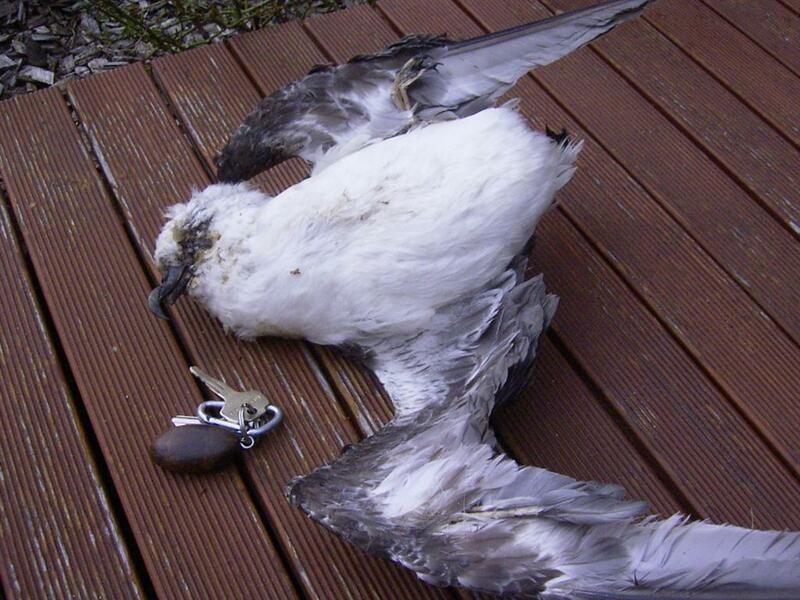 It didn't spare me, and neither did the Kelp Gull. As you can see the Caspian doesn't always win. 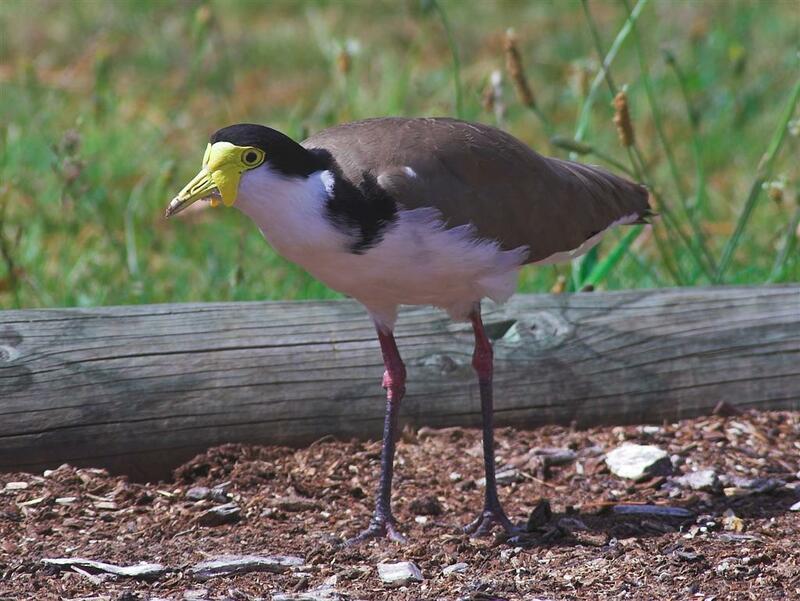 While on my morning constitutional round the Bellerive area, on Friday morning, I noticed a Masked Lapwing adult getting rather agitated as I passed the local Kindergarten. On further investigation, I saw a lapwing chick wandering round the grounds, keeping one eye on me. It is pretty late to still find chicks about, although by no means rare. 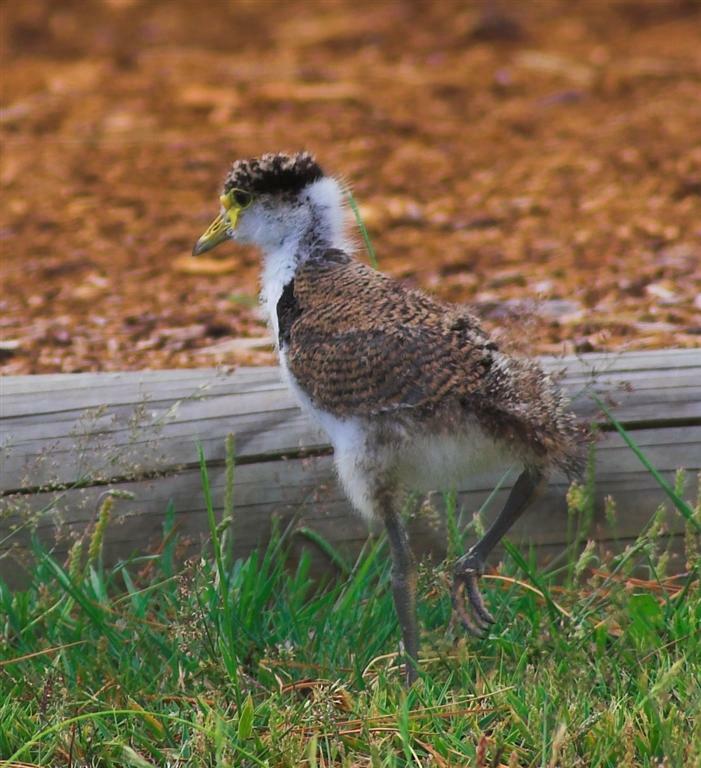 The local lapwing population of about 4 pairs has a hard time breeding these days, and I would think the chances of this chick surviving were not brilliant. There aren't too many animals that willingly take on the European Wasp. I know from experience that the appearance of a wasp at a BBQ or outdoor meal can quickly turn proceedings into chaos. Most of us appear to have our pet way of dealing with them, and having been stung by one, I am pretty wary of stirring them up. 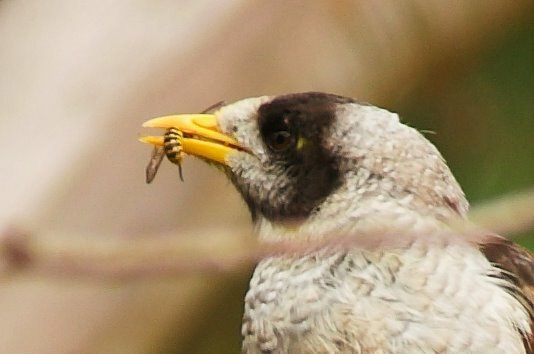 During a recent walk in a local park, I photographed a Noisy Miner, aware that it had something in it's bill. On looking closer at the image on my PC, I realised it was a wasp. Have we finally found something that feeds on these damn things? 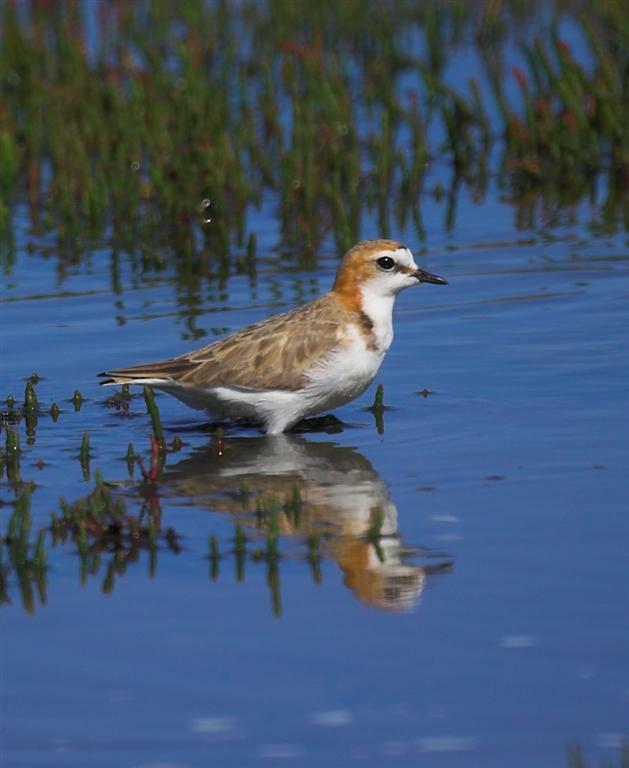 I'm quite used to Red-capped Plovers giving their 'broken wing' display, to draw potential predators away from their young, but I was surprised at this male flapping around in the water. The photo's not great, but shows the event--and it worked. At Orielton Lagoon today. 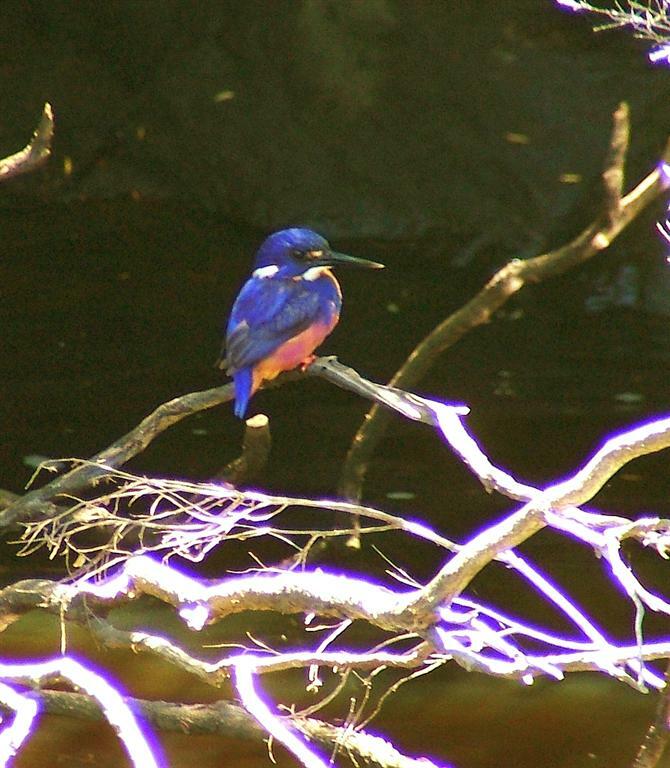 John Tongue writes: Having had such a good outcome from our Kingfisher search, we thought we'd really put our guides to the test and see if they could suggest where we might see Southern Emu Wrens. Despite trying many likely places, this was still one lifetime species that eluded Shirley and myself. 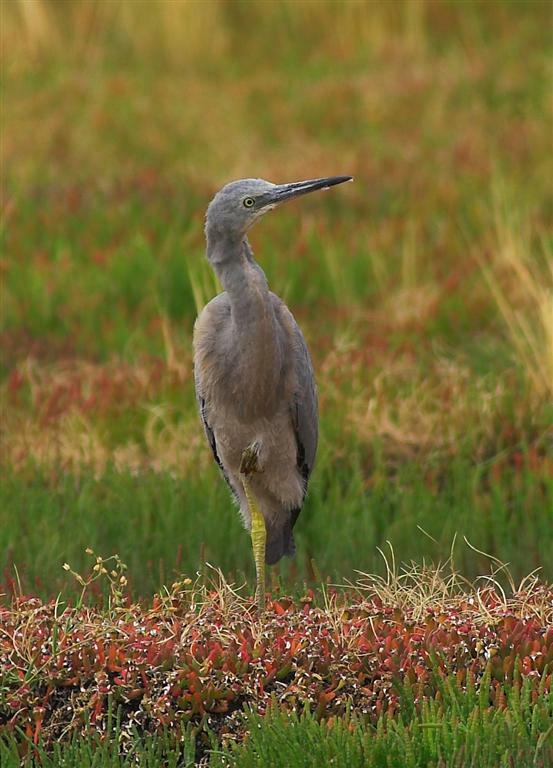 Our cruise guides said they didn't know, but suggested a local contact--Geoff King--who they reckoned knew all there was to know about local birding. We gave Geoff a call, and he was a bit hesitant, but suggested we try along a fire break only a km or so North of Arthur River. He said others he'd sent there reported getting good views of Emu Wrens. We set off along the fire break, which was pretty swampy in places, through Button Grass and Ti-tree plains, with stands of stunted eucalypts here and there. 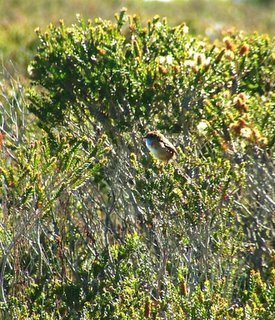 We saw lots of Superb Blue Wrens, White-fronted Chats and Blue-winged Parrots, but no Emu Wrens. 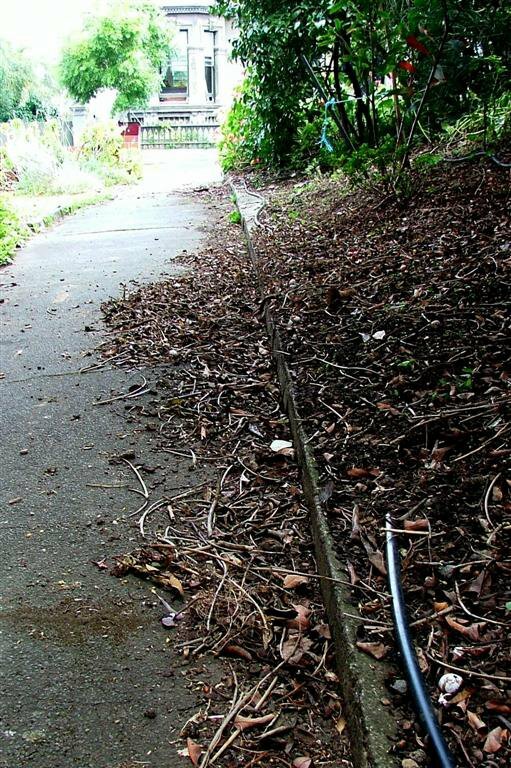 Geoff said that others had seen them "about where the fire break turns a bend". I guess we walked for an hour or so, skirting a number of flooded patches of track, through the Button Grass, before coming to the bend. We were starting to worry again that this search may prove fruitless, when just around the bend, we heard unfamiliar, insect-like calls coming from the Ti-tree thickets. We waited and watched until a male Emu Wren finally popped up, and ended up putting on quite a show for us. 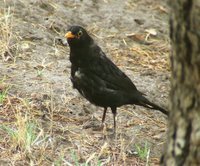 Sadly, because of the distance from the track, and the shyness of the bird about any movement, the photos are not brilliant. At least three other individuals were also heard calling in that location, but none spotted. We cut back to the main road along a dis-used 4WD track, hoping to flush Ground Parrots, but this time we really were unsuccessful (apart from the Tawny-crowned Honeyeaters, three more Emu Wrens and a Striated Field Wren). At least we had seen the Ground Parrots before, and we'd achieved our goal of seeing the Emu Wrens! 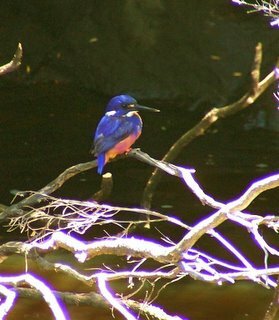 We can recommend the Arthur River Cruise for the Kingfishers (we went on the 'George Robinson', but are told either boat is good), and Geoff King as a local contact. Geoff also runs wildlife and birding tours in the area. Murray Lord asks: 1. 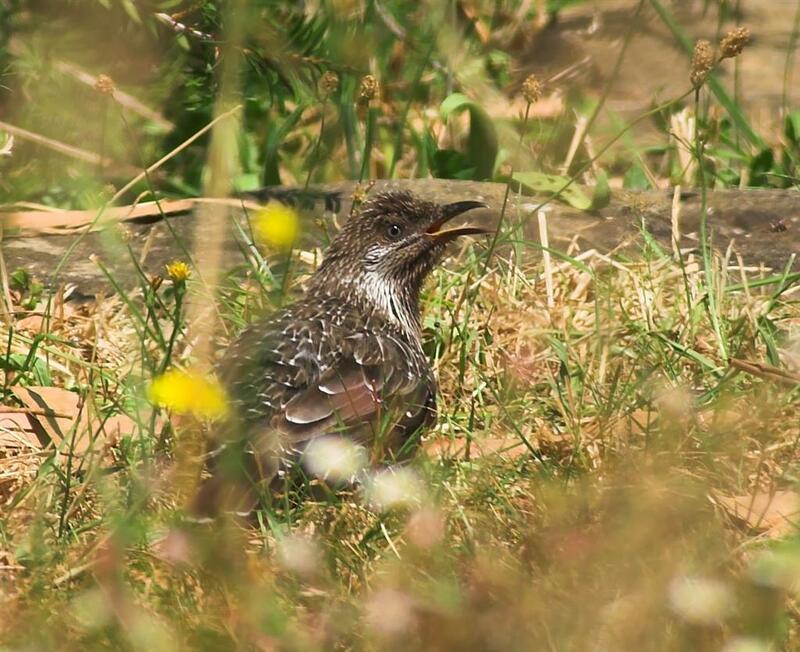 I read a trip report of a birding tour that claimed to have seen Tasmanian Thornbills at the Peter Murrell Reserve. It seems to me to be unlikely. Are there any records of "Tasmanians" there. As both tour leaders are aquaintances of mine I would love to tell them that they don't know what they were looking at! Mind you, I have always found them hard to tell apart. 2. I periodically get asked to suggest spots to see Tasmanian endemics around Hobart. Can anyone suggest any back up spots for Scrubtit? I always send people to Fern Tree Glade, but when I was there recently I didn't find one. Of course there are plenty of spots further West, but I wondered if there are other sites around the mountain. 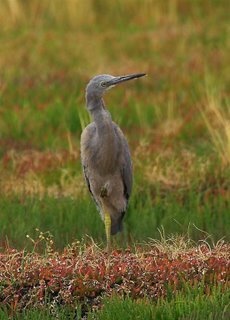 John Tongue writes: In June '05, my family and I had a fornight's holiday based at Stanley, walking, driving, birding and photographing around the far North West. One of the main ambitions of the trip was to see the Azure Kingfishers on the Arthur River Cruise. The day that we went on the cruise (the last day before they shut down for the Winter) was grey, drizzly and windy, and there was only my family (4) and one other couple. 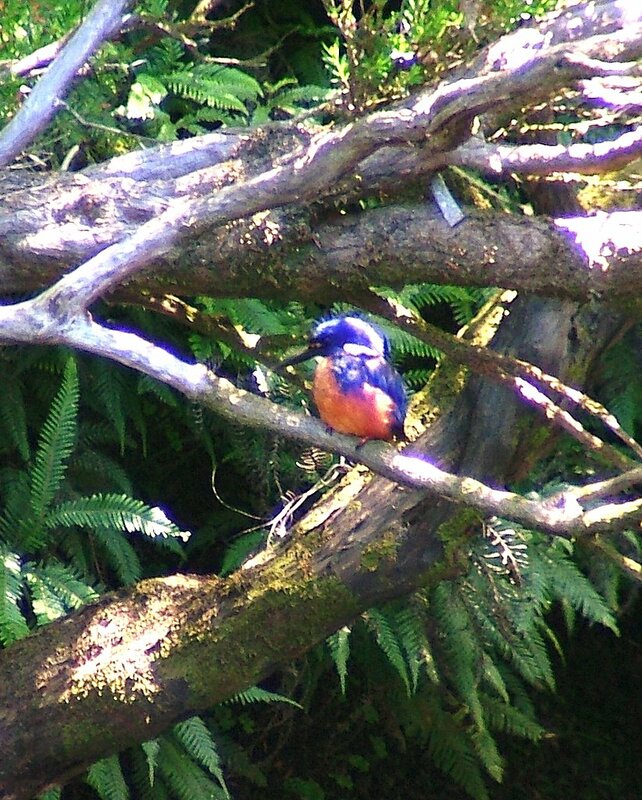 As soon as we boarded, we told them we had come specially to see the kingfishers, so we hoped they could find us one. The immediate reply was, Oh not this time of year! There are none around now!. You'll have to come back in Spring or Summer. We thoroughly enjoyed our cruise, and kept our eyes peeled, just in case, but to no avail. They're not sure where the birds go in Winter, they just know they're not around. So... we planned to go back for a few days in November, but that didn't work out either. Hence, we've just returned from a rushed sortie to the far North West. 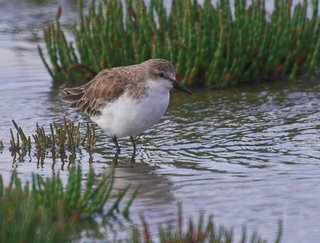 We drove from Hobart to Arthur River on Thursday, 5th, went on the cruise and did some other birding on the 6th, and returned to Hobart on the 7th.. Who say's birders are mad? The same 2 guides were operating the cruise as in June, and they did remember us. They said there hadn't been many birds around lately--should have been here in the Spring!-though they had seen at least one, most of the previous few days. We kept a keen lookout all the way up to the lunch landing, but nothing (in the kingfisher line). While the other tourists went for the rainforest walk, we sat by the river to scan for azure blue, but still nothing. We joined the rest for lunch, then reboarded the boat wondering if our trip would again prove unsuccessful. However, just as they were turning the boat to leave the landing and head back down river, one of the guides spotted a kingfisher fishing from low hanging branches into the river, just where the other guide said he had seen a nest tunnel. I snapped away furiously, just to prove we'd seen the bird, the results are appended here. They do seem just a little larger than the mainland sub-species--which we've seen many times--and the white "eye-spot" seems a little larger, and the blue extends down the sides of the breast a little further than Pizzey and Knight suggest. We were very glad to have seen that one bird, as that was it for the trip - and the Southern Emu Wrens a day later--did make our trip worthwhile. 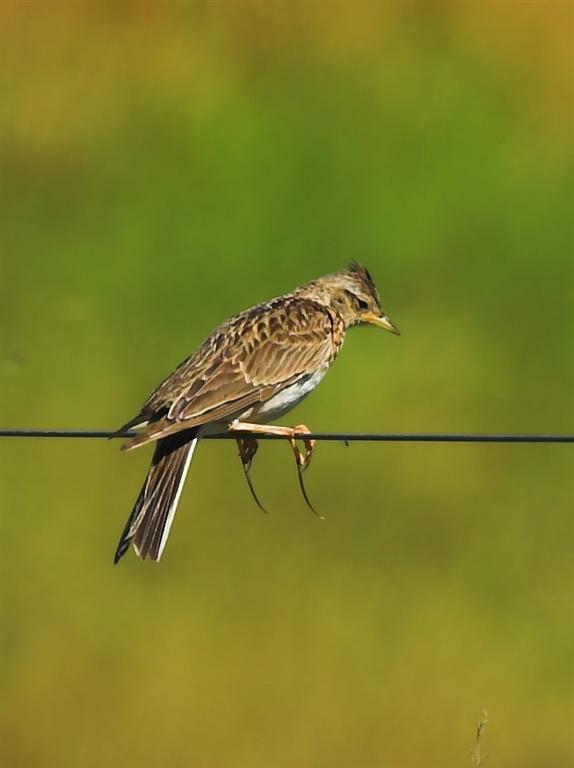 I photographed this Skylark today at Sorell, sitting as you can see on a fence wire. 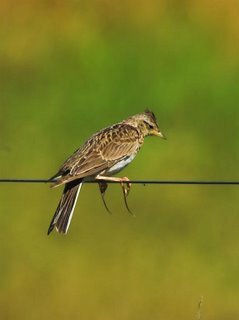 I more often associate seeing them sitting on posts or most frequently on the ground, but the photo highlights their incredibly long 'spurs'. Does anyone know what function they serve? A White-headed Petrel, long dead, was found in the bush on 1st January ,at Dolphin Sands by Anna Povey of Trevallyn, who sent in pix, one of which is attached. Found some 100 metres back from the beach, possibly carried there by a dog. Murray Lord writes : Just before Christmas, I visited the Peter Murrell Reserve(at Kingston). In the course of an hour and a half, I saw eight out of Tasmania's twelve endemics, plus plenty of other interesting species. 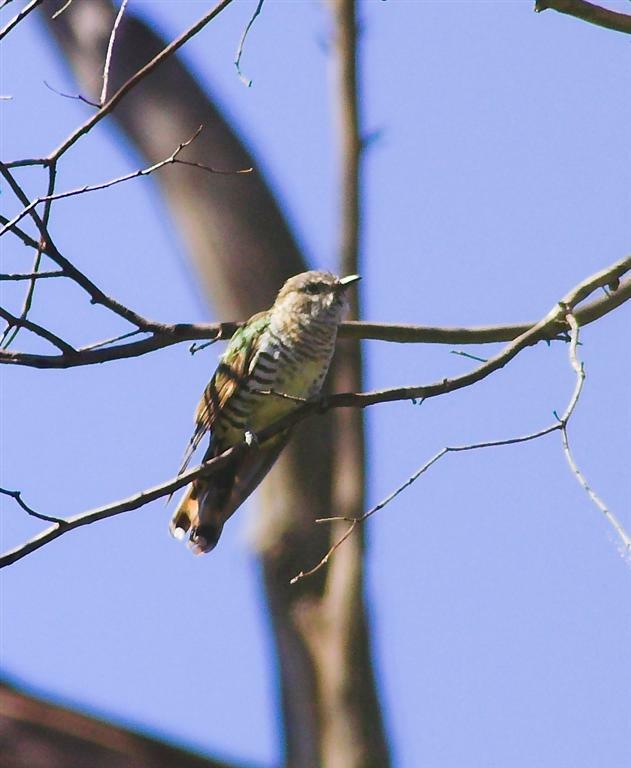 A young Pallid Cuckoo was observed being fed by Strong-billed Honeyeaters. 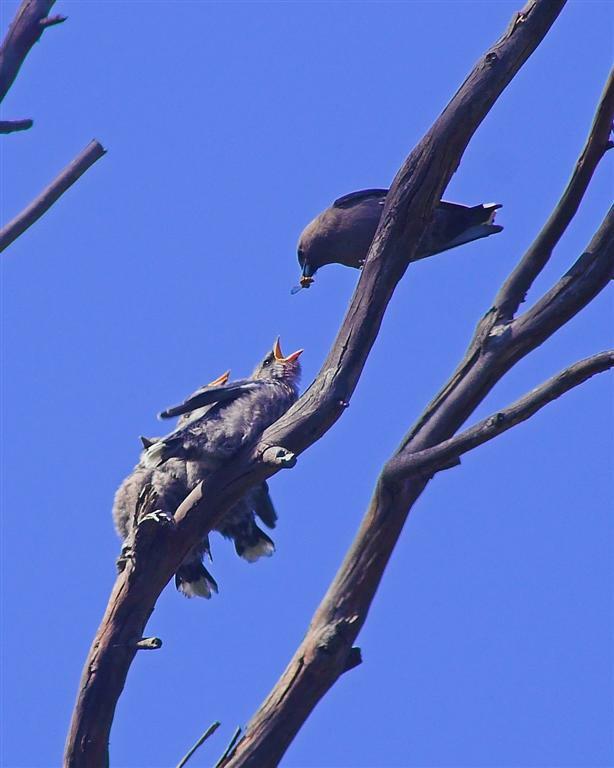 When the strongbills flew off a Black-headed Honeyeater came along and fed it too. 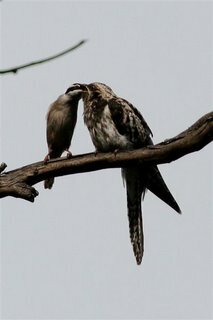 This is not the first time I have seen two species feeding a young cuckoo. Both previous occasions were also in Tasmania and the common link is that on each occasion one species involved was the Black-headed Honeyeater. The other species involved were a Scarlet Robin and a New-holland Honeyeater. Has anyone else seen this? 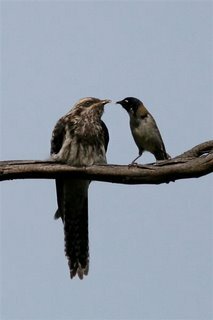 Does this mean that Black-headed Honeyeaters are unusually gullible? 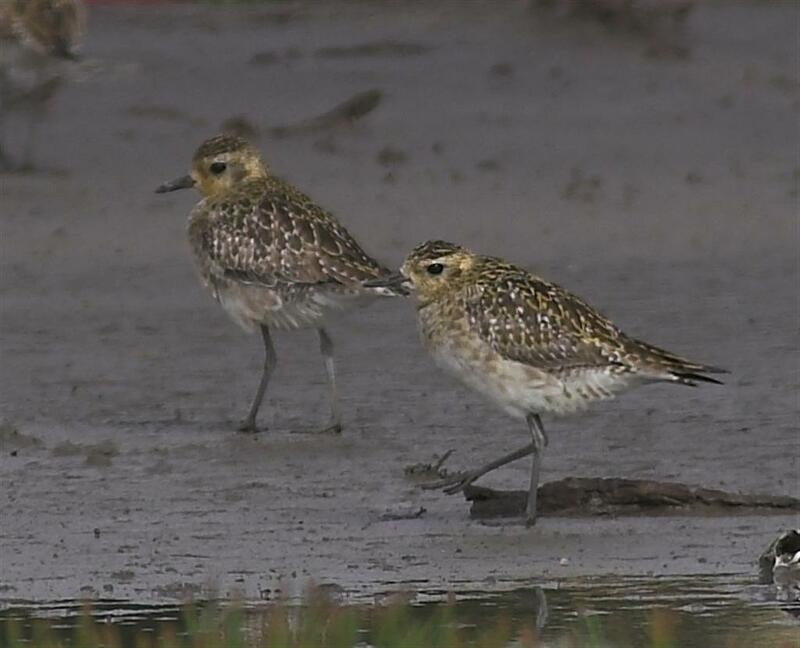 Murray's pix: left, Strong-billed, right, Black-headed. 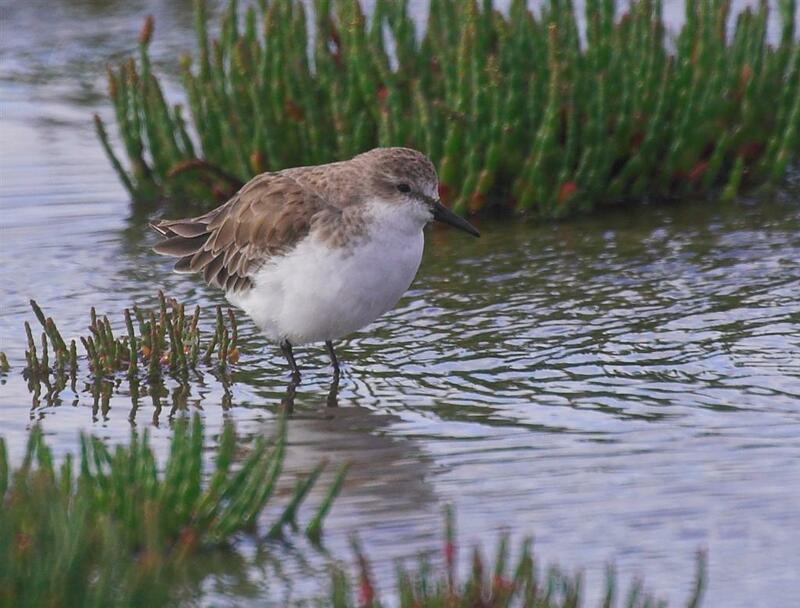 Just received an e-mail from Murray Lord saying that he had met an English birder while returning to Sydney after the Christmas break, who was pretty sure he saw a pratincole. The sighting was between Georgetown and Low Head, but too far away to identify which species was involved. He saw it both perched and flying. Murray comments that the birder involved seemed experienced and realised it would be an unusual sighting if correct. Well worth a look! I don't know about anyone else, but the recent days of high wind have been very trying and not very conducive to birding. 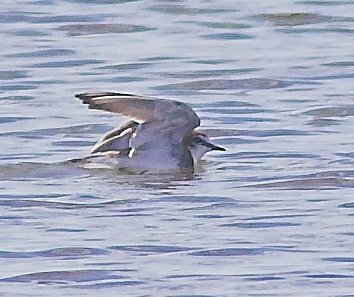 However, always prepared to give it a try, I sallied forth yet again to Orielton Lagoon, primarily to try to twitch the White-winged Tern. Needless to say, I didn't see it, but I did wander round the sewage ponds and I think that with luck this area could be worth keeping an eye on. Seen there were several Pied Oystercatchers, Chestnut Teal, Black Duck, Wood Duck, Mountain Duck, Black Swan with a cygnet and Hoary-headed Grebes plus large numbers of Native Hen, Skylarks, Pipits, a Brown Hawk, Musk Lorikeets , Galahs and the remains of 2 stint--no idea how they died and obviously long dead.